Learning to be Human: Universities in a world of rising inequality and technological change | The Forum Network, hosted by the OECD: Shape ideas. Shape policy. Shape the Future. In a world of rising inequality and threats to the long-term sustainability of liberal democracy on multiple fronts, how can universities help? Duncan Ivison, Deputy Vice Chancellor (Research), University of Sydney, examines how they can contribute to more inclusive global economic growth, reduce cultural and economic tribalism and help harness the extraordinary technological developments of our age for the public good. I believe there are three crucial contributions our universities can make to an inclusive 21st century society. The first is that we must become genuine engines of social mobility and equality of opportunity. The deepening of social and economic inequality is one of the greatest challenges liberal democracy faces today (and other countries such as China, for that matter). Inequality fuels populism and makes fertile ground for a deeply reactionary form of politics unsuited to the complex times in which we live. It undermines the aspirations of working people and their families, eroding hope and trust. It blunts social and economic development by reducing the opportunity for people to succeed on the basis of their talent and ideas, as opposed to the areas in which they were born. And it hollows out support for liberal democratic political institutions that depend, to varying degrees, on the promise of social and economic equality – or at the very least, genuine equality of opportunity. Thus our universities – and our tertiary systems as a whole – must remain accessible to both young and older students on the basis of ability and potential alone, and not their parents’ income. We know that the future of work will be transformed by greater automation and technological disruption. The vast majority of new jobs that will be created over the next decade will require tertiary training of one kind or another. The most vulnerable are those with a high school education or less – and their children. They will feel the impact of this tsunami of change first. And it is already reshaping politics globally. As Bruce Reed, former chief domestic policy advisor to President Bill Clinton has put it: those who need help the most tend to lose hope first. So our tertiary sector must become even more accessible than it is now for all of our citizens. Whether delivered through universities, technical institutes or vocational training, in both public and private settings, access to higher education needs to be reimagined and reinserted in the new social contract for 21st century liberal democracy. But there are worrying signs. In the United States, funding at both state and federal level is being cut; worse, accessibility is not improving. 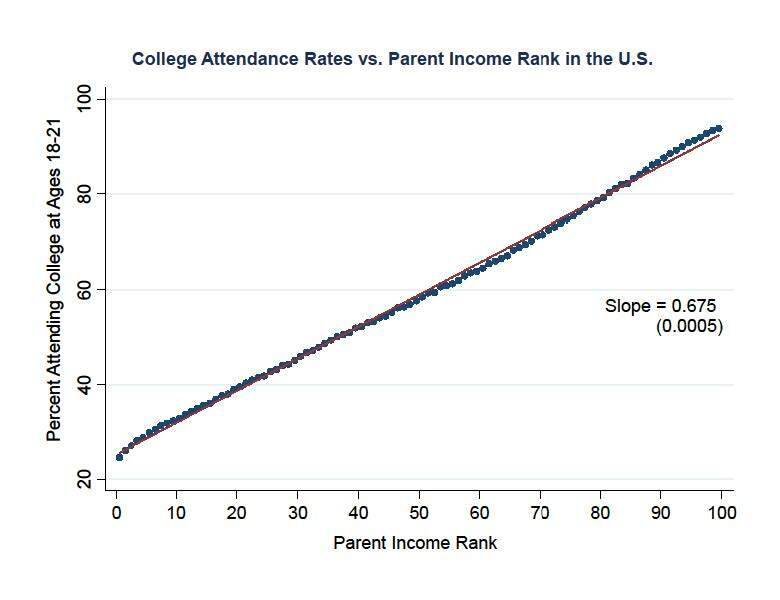 In his recent Le Monde blog, Thomas Piketty pointed out that there is almost a linear relationship between parental income and college attendance in the US. In Australia, although there has been an improvement in higher education participation rates for those from low socio-economic backgrounds, progress has been slow, and the current government is backing away from a “demand-driven” approach. The second contribution universities need to make is through performing research as well as changing the way we conceive of our research mission. In an age of transformative technological change, our universities are making significant contributions to the economic and social well-being of our national and global economies. In Australia, for example, the office of the Chief Scientist estimates that the direct contribution of advances in the physical, mathematical and biological sciences alone contributes AU$184 billion to the Australian economy every year. Even more importantly, we need universities to harness their research strengths in new, multidisciplinary ways, and help address problems that neither governments nor firms can tackle on their own. For example, addressing the global health burden of obesity, diabetes and cardiovascular disease will not be solved through biomedical solutions alone, and certainly not by the marketplace. It is a classic “wicked problem”, combining biochemical, economic, social, cultural and political dimensions. And yet if we do not provide new policy approaches, informed by scientific, social and cultural analysis, the impact on health systems throughout the world will be devastating – including, somewhat paradoxically, in the developing world. Initiatives like the establishment of the Charles Perkins Centre at the University of Sydney, which brings together scientists, clinicians, economists, philosophers, industry partners and community groups to tackle chronic disease from a “complex systems” perspective, will be vital. The 21st century research-intensive university will be an inherently multidisciplinary one. Finally, universities need to embrace a new agenda for public engagement. At a time of “fake news” and deep scepticism about expertise – despite facing unrivalled complexity in the challenges that confront us – we need to find new ways to disseminate our research and teaching in ways that inform public debate and policy making. Importantly, this means making the boundaries of our universities more porous and our research more visible and transparent, in order to build trust with the communities we serve. Inside the university, this means rewarding our faculty for effective public engagement, not something we have always done consistently; outside, this means forging better partnerships with industry, civil society organisations and governments. This will not only bring our expertise to bear on their problems but also welcome them into the university and help us learn from those challenges. The Sydney Policy Lab is our latest major initiative to achieve this, fostering genuinely collaborative partnerships and providing an independent, neutral space to discuss and tackle complex local and global issues. The agenda for public engagement also means developing new, long-term relationships with our students and their families so that they can remain engaged with us over the course of their lives – to retrain, brush up on skills and deepen their understanding of the world around them. Perhaps here we have something to learn from a “subscription model” service like Spotify, as opposed to our up-front tuition fee model that has been the norm until now. None of these three contributions are easy to achieve. And there is only so much our great educational and research institutions can do. But they are a vital part of the reform agenda. Universities need to embrace the challenge of becoming the engine rooms of social mobility in an age of rising inequality, deep technological change and profound social and cultural shifts. They must also remind us that higher learning is also about finding out what makes us human in the first place. Wonderful article, I would add that perhaps the role of learning to be human is a GROUP endeavour. Too many business and other schools in Universities are focused on developing individuals. The future is collective and human systems are more Group-ish than solitary. It will be interesting to see more multidisciplinarity at Doctorate levels.